As well as suggesting interesting articles online or in your weekly emailed metajournal, you can now also browse articles by journal, year or even just scroll through a single journal issue. Simply click on the journal name or issue date above an abstract to focus your abstract browsing. So whether you want to see the latest articles from the British Journal of Anaesthesia, the top articles of 2017 from the American Journal of Emergency Medicine, or simply browse through the October issue of Current Opinion in Anesthesiology, metajournal can keep you up to date. Of course, signed-in users can also search across any of these scopes – say, if you want to see the top remifentanil abstracts from IJOA, or find that elusive C-MAC c-spine article you vaguely remember seeing in a 2017 Am J Emerg Med issue – just hit the Search... button. Metajournal's CPD reporting feature has been fine-tuned in response to some great feedback from metajournal users. This will better track the articles you read, either online or those metajournal suggests to you in your emailed metajournal article digest. Perfect for providing to your professional college, specialty board or institution. Metajournal subscribers can download their latest, updated quarterly CPD report with one click! 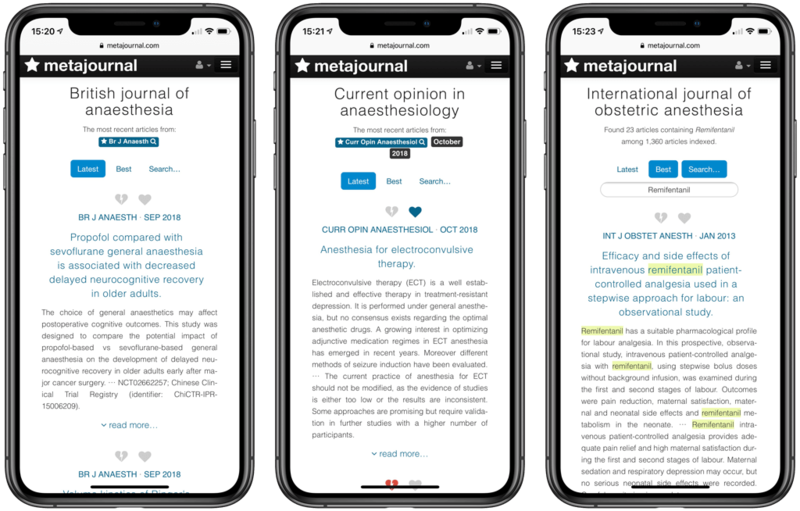 Anesthesia and Analgesia's companion journal Anesthesia and Analgesia Case Reports is now indexed by metajournal, after being requested by our users. A & A Case Reports has only been around since October 2013, after spinning off from the prestigious Anesthesia & Analgesia. It is now a standalone publication "...devoted exclusively to publishing cases that are educational and unusual." You can jump in a browse the latest from A & A Case Reports among our indexed journals. Anesthesia & Analgesia has now evolved A & A Case Reports into A & A Practice – naturally, also indexed by metajournal! 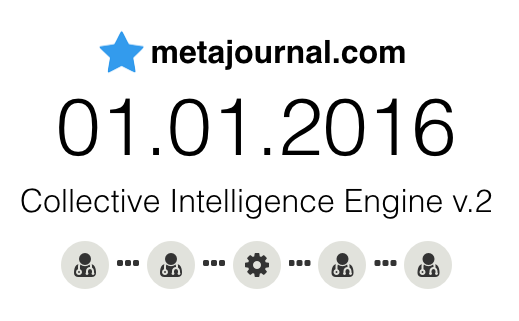 Metajournal: now over half a million articles indexed! Wow. Last week metajournal quietly indexed it's 500,000th article! We now track over 100 journals related to critical care specialties: anesthesiology, emergency medicine, intensive care and pain medicine. Everyday metajournal indexes, qualifies and assesses new articles published not just in these journals, but also the highest quality articles that are related to articles from these journals, regardless of where they are published. This ensures that if a quality, significant and personally relevant article is published outside the core specialty journals that you follow, metajournal will still recommend the article to you. Incredibly, only 9 months ago metajournal was celebrating indexing it's 50,000th article. Grow on! To welcome in the new year, metajournal quietly rolled-out a big update to the machine learning magic that is the foundation for recommending quality, significant and personally relevant papers to you based on your professional medical interests. The metajournal Collective Intelligence Engine, is the secret sauce that integrates evidence with your own interests, along with topics that other clinicians in your specialty are following and interested in. Not only does metajournal look for quality articles that are relevant to the Topics and Journals that you follow – metajournal is now smart enough to follow your article reading behavior. As you read and favorite papers and abstracts, metajournal learns more about the types of articles that you find most interesting and relevant – the topics, the authors, the journals, and many many more features. Metajournal will even recommend particularly relevant papers that are outside your followed journals, reducing the chance that you miss something truly important. Metajournal is also smart enough to understand which articles you do not find interesting – simply click the not interesting... link under an abstract and metajournal will grow a little wiser by understanding what is not relevant to you. The best way to get the most out of metajournal's growing intelligence is simply to teach metajournal more about what interests you: follow interesting Topics, click through to Read interesting abstracts and Favorite the most interesting papers, and when metajournal suggests Not interesting... articles – click the link to tell it!